Last winter it felt like every single restaurant I went to there was some sort of kale salad on the menu. Usually some sort of hard cheese was involved like pecorino or Parmesan. There was sometimes fruit on it. And it was always massaged. I want a massage. Good gracious, enough with the dang kale, man. The last thing this universe needs is another kale salad. And here I am throwing another kale salad in your super cute face. But, this kale salad is really good. And there’s lardon dressing involved. I mean…bacon fat dressing, c’mon! This lardon situation was supposed to be guanciale, which is my current love, but when I headed to my local hipster super artisinal neighborhood market and they didn’t have it, I turned to bacon. I figured if I couldn’t get it, you probably wouldn’t be able to find it either. So, instead we have this bacon/lardon situation. 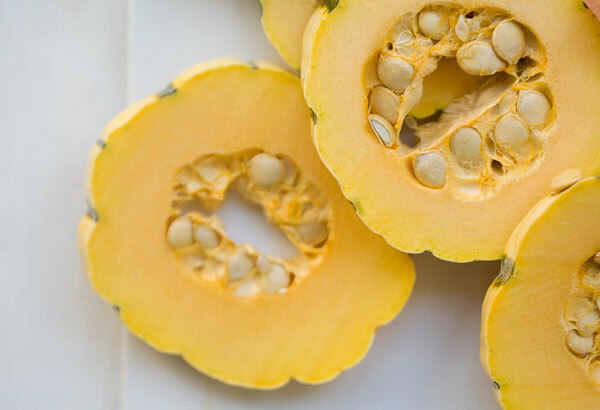 This salad is as fall as fall can get. 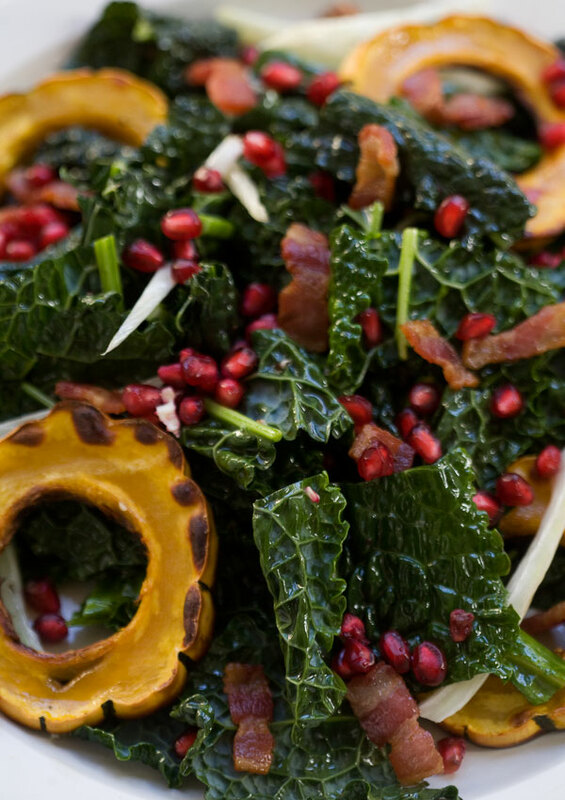 There’s fennel, roasted delicata squash, pomegranate and sturdy kale. The kale can easily be swapped out for another kind of green, it just needs to be able to stand up to the hot, warm dressing and not wilt and wither away. This salad is easy with a capital E. The lardons are fried up in a pan, removed and then to that fat the dressing is made. A heavy splash of red wine vinegar, lemon juice, lots of pepper and a garlic clove are added to make up the dressing. The mixture is poured over the kale and massaged and tossed until the kale softens a bit. It’s a winner of a salad. You know what you don’t need? A guacamole recipe. I dunno. Maybe this is me being a total brat, but honestly, even if you don’t know how to boil water, the last thing you need is a recipe that involves mashing, folding and adding salt. That’s just silly talk. I lamented for a long time about sharing this situation you see pictured because why do you need this?! You can do this without me. Who am I to tell you how to make your guacamole. But, I love it. So I figured that maybe you would, too. 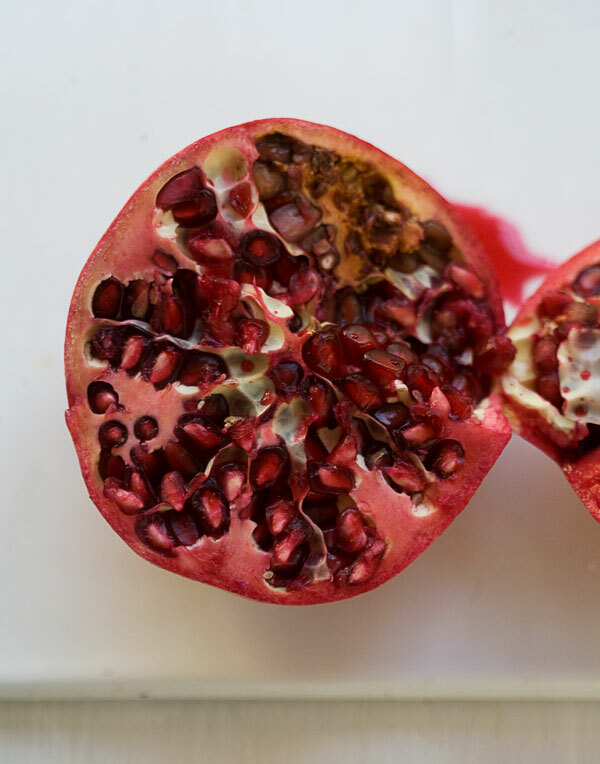 And maybe you never thought to put pomegranate seeds in guacamole. And maybe you’ll make it and share it with someone. That’d make my day. So here I am. Just a girl…with a bowl of guacamole, asking you all to mash up some ripe avocados, mix ’em with some chopped up cucumbers and pomegranate seeds. It’s way more special this way! Refreshing, sweet, lime-y…special! It’s Wednesday. I’m all sorts of sleepy. I have a huge to-do list. Yet my brain keeps replaying how Teresa (from RH of New Jersey) pronounces “cumin” and says “ingredient-enses.” Wish I could get that out of my head. For real. I’m also looking at my google reader and obsessing over my new blog addition. No. No. It’s not a new fashion or food blog or lifestyle blog. I want to share it. It’s major. Just kiss your whole morning productivity away because you’re in for it. Wait. Hold on. I have to say something before I share my new obsession. The disclaimer is this: Of course I would never hurt an animal, and yes, I’ve had a hurt animal before and my heart cried. Literally. But holy geez…is this cute. It’s a tumblr called…wait for it…wait for it…Animals with Casts. OMG! OMG! OMG! It’s just a gigantic damaged animal cute-fest. It’s crazy. All I want to do is reach through the screen, smother them, console them and make them homemade dog and cat treats. UGH! And dog soup. I’ve been thinking how I can make dog soup a thing for weeks. What do we think? Beef broth, butternut squash puree, pieces of beef jerky, more veggies. I swear I’m making this happen.